Here's a superb new online slots game from Microgaming that you can play anytime. Big Kahuna II Snakes & Ladders is a sequel to the popular Big Kahuna slot released in 2003. Unlike many sequels, this new version set in a stunning tropical paradise is bigger and better than its predecessor! Check out our entire list of Slots games. Who says you should always avoid sequels? 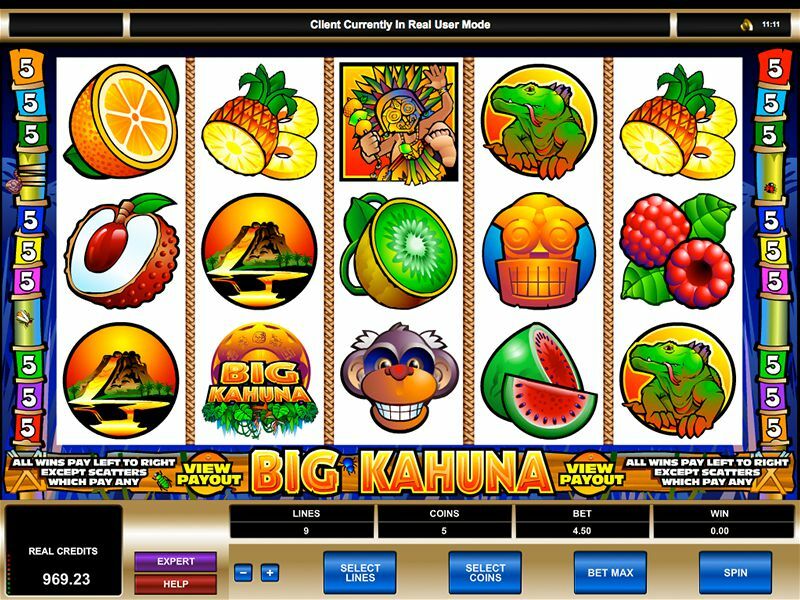 This follows up to the original Big Kahuna slot is a blockbuster of a game with more paylines, bonus games and free spins to keep the entertainment to the max. It’s got a similar tropical theme and idyllic island backdrop and you are on a mission to find the Big Kahuna’s tribal mask. But watch out for the slithering snakes who are trying to stop you discovering it. It’s worth taking the risk though as Big Kahuna II can net you an enormous jackpot of 200,000 credits, plus 30,000 handy credits from a bonus feature! Big Kahuna wild - The wild in this game is the Big Kahuna icon and this can take the place for all symbols bar the scatter. 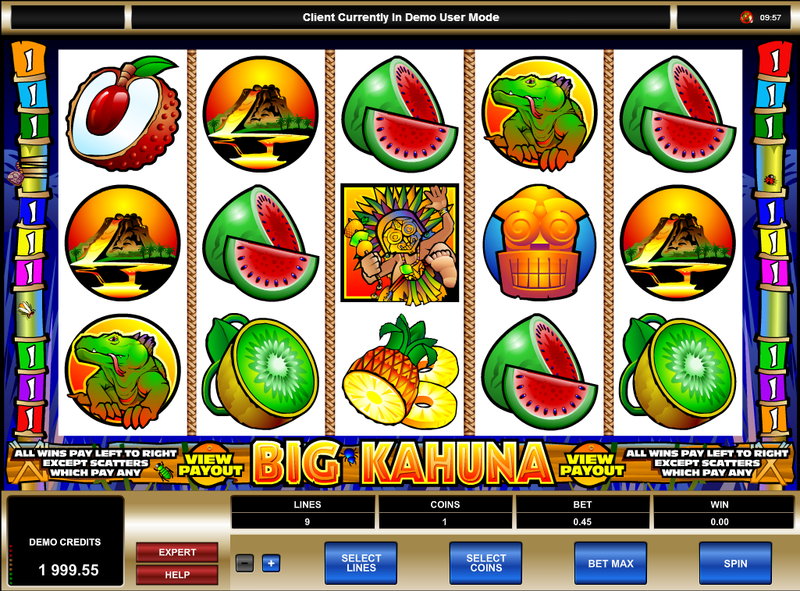 The Big Kahuna wild is also a multiplier for all the wins you land in the standard game. When you get your hands on 5 Big Kahuna logos in succession you’ll really be in the money and receive between 5000 and 10,000 credits! Free spins bonus – Free spins in this game are given completely randomly. If you’re lucky enough to land some you’ll get 5 free spins and all wins during those will be doubled. If your free spins appear when the Big Kahuna wild is active any payouts will be quadrupled! Snakes and ladders bonus – If you hit the snakes and ladder symbol on the 1st, 3rd or 5th reel you’ll get your hands on a cheeky little game of old-school snakes and ladders! If you negotiate the board and avoid the snakes you’ll be rewarded with the mask and 100x your bet. This is one sequel you don’t want to miss. An improvement on an already very playable – and very rewarding – slot. Whether you win big or just tick over nicely it’s a really enjoyable play and does live up to the hype. The prizes are important but you can’t fail to be wowed by the graphics in this game whether you win or not. Bright, vivid, intensely colourful and really well-designed cartoon symbols, it’s a slot that will lift your spirits just giving it a spin.